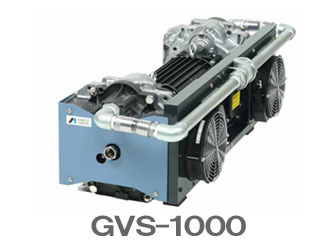 The GVS Series makes scroll vacuum pumps more familiar. They can be used in low-vacuum regions. The lineup supports pumping speeds from 250 to 1000 L/min. Vacuum forming, vacuum chuck, etc. With the pumping section containing no lubricating oil or sealing water and no bearing equipped around the part touching gases, these are completely dry pumps that provide clean vacuum and no oil mist. The pumps are of a completely dry type, and the air-flush function makes them better able to exhaust water vapor and foreign matters and provides greater durability and a longer maintenance cycle. Operating efficiency has been dramatically improved as loss of vacuum does not occur even during prolonged operation. The pumps can be installed for near-hand operation as orbiting scroll generates only moderate noise. 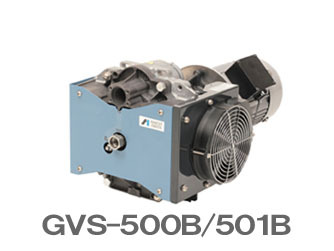 Under normal use conditions, periodical maintenance is only required at two-year intervals for GVS-250 and at one-year intervals for GVS-500B, 501B and 1000.Daily maintenance cost can be reduced. We will be happy to accommodate your specific needs for fluororubber, different voltage, etc. Safety precautionsThis vacuum pumping system is suitable for clean processes only. Do not use toxic, explosive, flammable or corrosive substances or substances which contain chemicals, solvents or particles. ANEST IWATA will not perform maintenance work on pumps which haveUse at ambient temperature in the range of 5°C to 40°C.